Aleomandra offers you a chance to enjoy the striking natural beauty of Mykonos. Perched on the south west corner of the island, it’s home to a golden sandy beach which is protected from the winds by the rugged cliffs surrounding it. Dotted throughout the area you’ll find luxury hotels and villas, while those wanting to explore can hire a car and make the most of the many beaches peppered along the coast. Due to its location Aleomandra is ideal for couples wanting to enjoy a luxury break. It’s quiet and tranquil with picture perfect surroundings and a chance to admire the island at its best. Mykonos Town is just a 20-minute drive away and provides excellent opportunities for day trips. Here you’ll find the traditional windmills overlooking the town as well as whitewashed streets full of little boutiques and shops. Wander through the winding lanes before stopping off for a candlelit dinner in one of the little squares. Your luxury holiday in Aleomandra will take you to the quieter side of this lively island. It’s close to the bigger towns where you can shop, enjoy excellent cuisine, or relax in bars, while having its own atmosphere and amenities. Immerse yourself in local culture as you enjoy a selection of Greek dishes in one of the restaurants or tavernas before unwinding with a drink as you listen to live music in a local bar. This side of the island is well known for its beautiful beaches, making it ideal for those who simply want to relax. Book with Sovereign and you can take advantage of our customer service and expert advice, before finding the right hotel for you. 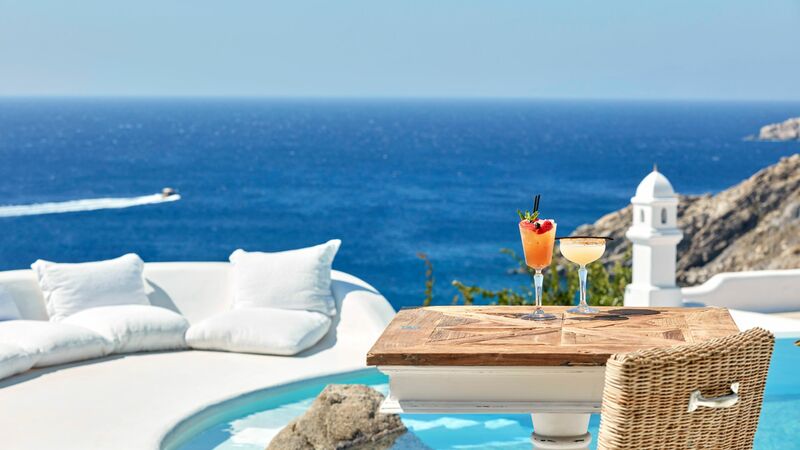 Choose the Kirini My Mykonos Retreat where you can admire the traditional whitewashed buildings of the island, an elegant terrace, an extensive spa menu and excellent boutique service. The flight to Mykonos is around 3 hours 45 minutes from the UK. Transfer time from Mykonos airport to Aleomandra is approximately 20 minutes. Spring and autumn are ideal for sightseers in Mykonos, with daily sunshine and temperatures staying around the early 20s. For the best beach weather, however, expect the mercury to soar past 30°C throughout July and August, although Mykonos’ location means you get some tempering winds to take the edge off the heat.